That’s a misleading title. I know exactly why I can’t lose weight. I know exactly what I need to do. Maybe after spelling it all out, seeing it in black and white, I will be encouraged to make the changes I need to make. I have always thought I was fat. Even when I was 17 and 85 pounds (I’m 4’11”), I thought I needed to lose weight. Part of this comes from being built like a two by four–all straight up and down, not a waist to be seen. In high school I was using appetite suppressants, until my friend Dan saw them in my locker and threw them away. 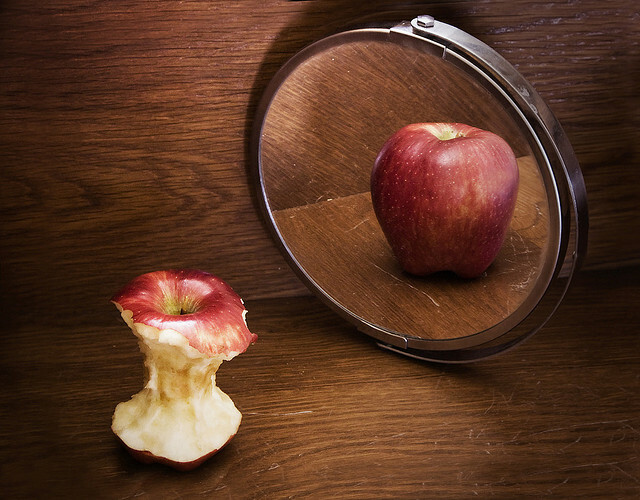 The beginnings of some awesome body dysmorphic disorder. I gained my 15+ pounds in college, subsisting on french fries and pizza. Fifteen pounds on a short person is like thirty on everyone else, I swear. I lost the 15 pounds. I gained slowly through the end of college and into my first years teaching; by the time I was married I weighed the most I ever have. Luckily, my husband (who knew me when I was 85 pounds) didn’t care. I cared, though. I don’t really need to know what to do–I’ve done plenty of research, tried and failed with the quick fixes, cleanses, etc. I just need to do it. And I need to love myself a little more for what my body can do. I grew two human beings, after all. 1. I love food, mostly food that is really not good for me. I love processed meat like bacon and salami and pepperoni. Cheese makes me giddy. Haagen Daaz chocolate ice cream is my ambrosia. I love bread and pasta. I crave fried food. I covet creamy sauces and soups. I like my beer. I know the answer is to eat less of that and eat the healthy, delicious food that will fill me up and keep me healthy. 2. I hate cardiovascular exercise. I can strength train for days. I love yoga. I enjoy walking. I need to move, though. I need to get my heart rate up for extended periods of time, and quite frankly, if I even have a slightly better offer, I will take it. 3. I drink beer. Maybe one or two every night. I don’t want to reach some magic “everything will be perfect at this weight” weight. I just want to fit into the clothes in my closet. I want to not hate myself for my lack of control, my laziness, and my gut. 1. I quit smoking 4 years ago. 2. I quit drinking Diet Coke. 3. I increased my garden size by 100%. 4. I started doing yoga regularly, and am walking a couple days after work with my friend and colleague. 5. I eat breakfast every day. 6. I joined my building weight loss challenge to keep me honest, and participate in the wellness program. For the wellness program I keep track of things like fruit and veggie intake, sleep, exercise, flossing, etc. I turn my card in each week, and am entered into a drawing. I actually won today…50 bucks. Woohoo. 7. My husband makes sure I have vegetables at every meal. 1. I will do at least 20 minutes of yoga 6 days a week. 2. I will walk more–and perhaps figure out how to turn myself into a runner. 3. I will only drink beer on weekend nights. 4. I will start using my Bow Flex again. 5. I will concentrate on making and eating healthy food, most of the time. 6. I will try to remind myself that being overweight doesn’t automatically make any good qualities I have null and void. The time to begin is now, I know. I’m trying to not make drastic, unsustainable changes. I’m not looking for miracles…I just want to fit into my clothes again. I want to stop beating up on myself because of how many chins show up in a photo. I want to enjoy every day and not waste time on negative self-image, and stop comparing my body to everyone else’s. Is this too much to ask? In the last few years, I have felt like my body is slowly falling apart–nothing serious, rather a compilation of minor complaints that are increasingly demanding more notice. I have always carried my tension high, so my neck, shoulders, and upper back always ache. I have tinnitus. My mid-range hearing is unusually poor for my age, and my dry eyes are making it difficult for me to continue to wear my contacts. All annoying, but all reasonably “overlookable”. I have one problem, however, that has begun affecting me more obviously: I can hardly hardly grip anything in either hand without pain. When I use scissors, I have to regularly change hands–same with sweeping, holding a hair dryer, weeding, mixing batter, and brushing my teeth. We had to buy an electric can opener. I have difficulty opening nail polish bottles. Downward Dog is painful. I tried to help my husband pound some nails in the garage we are (he is) building, and it was an utter failure. Switch hands, shake them out, switch hands, do hand exercises, shake them out…I have been feeling pretty useless. Even worse, my love of knitting is threatened, for obvious reasons. My mom had carpal tunnel surgery–I figured I was headed that way, or perhaps experiencing some early onset arthritis. Just before I was ready to make the appointment with the “hand doctor”, I read an article about the benefits of acupuncture for this type of pain. I canvassed my Facebook friends and received back numerous names, and I picked one: Melissa. I had to wait 2 weeks for my first appointment. In the meantime, I filled out the extensive paperwork she sent, and imagined what acupuncture would really be like. I have already been working myself toward a healthier lifestyle. Three and a half years ago I quit smoking. Three weeks or so ago I quit Diet Coke. I joined a Healthy Weight Challenge with my co-workers. I became reacquainted with my “So You Think You Can Dance”, “Bollywood” and pilates fitness DVDs, and signed up for a Vinyasa Flow Yoga class. I have a long way to go, but every little step, right? My appointment was today. When I sat down with Melissa, she asked me a lot of questions to further her understanding of what I’d written in the paperwork she’d sent to me. She looked at the side of my tongue. She checked my pulse. Then she had me remove some clothing and lie on my back on a massage table. The table had a heating pad and soft blankets. I closed my eyes and tried to relax, and I could feel her swabbing certain points on my arms, hands, and legs with alcohol. Next, she inserted the needles The needles are very thin and almost hair-like. She placed two in my head–hardly felt it. Then she started putting them in my left arm, and while it wasn’t exactly painful, it did make me jump a bit, rather like mini stings. Melissa worked very quickly–but I’m not going to lie–I was glad once they had all been placed. The most unpleasant were the ones she placed in the webbing of my fingers. When Melissa returned, she quickly removed the needles, and said to sit up very slowly and carefully and get dressed. Before I left, she gave me two little acupressure bandages to wear on my hands to extend the benefits of the treatment for another day. We scheduled 3 more appointments, and I was on my way. Wow. A few hours later, I still have this oddly heavy, yet energized feeling. One side effect was some “bathroom time”. Again, TMI, I’m sure, but I wanted to share my entire experience for those interested in pursuing acupuncture for themselves. I like the idea that each session can target a variety of ailments, instead of visiting specialists for each of my individual problems (ENT for tinnitus, etc.). I like the idea that I am not increasing the number of medications I am taking…she recommended Chia seeds and probiotics. 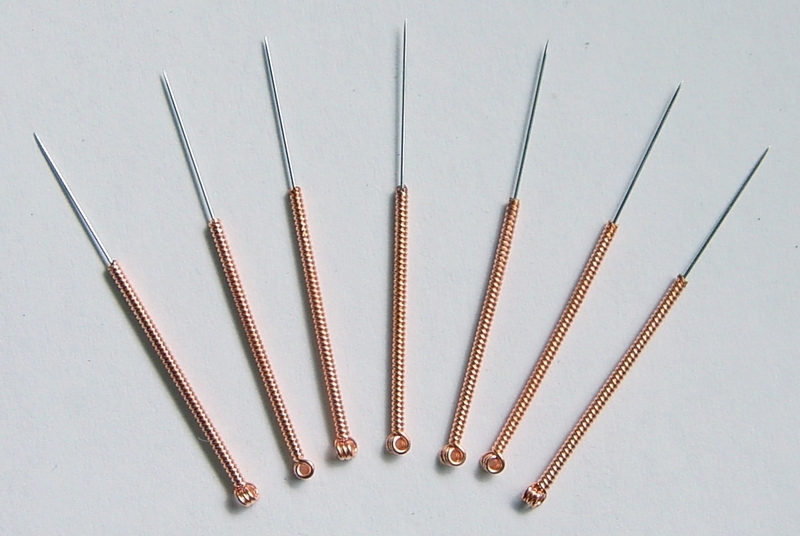 Even though there are plenty of skeptics out there, I am, for the moment, sold on acupuncture…it is a little early, but the “sudden” lack of pain in my thumb is a positive sign. I should have had her take a picture of my arm with the needles inserted. Maybe next time! Have you used acupuncture? What was your experience like?